To add an custom image size for your wordpress template you need to add the following code to your functions.php file. To limit the post being displayed on a category or archive page. You just need to add the following code to the top of you archive.php (or category.php) file. 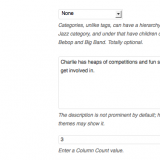 Using a Yootheme template and need the ability to set a columns for individual categories in Wordpress? I did and this is how i went about it. Recently working on a clients website i needed a different styled layout for one category.